I know Thanksgiving wasn’t even a week ago and you might be thinking I’m jumping right to Christmas but that wasn’t my plan and I’m SO far from it this year. I actually had plans to share a salad today and jump to some holiday baking next week. Only problem is I shared a salad last week right before the big Romaine Recall and I got a lot of messages about swapping it out for those already planning to make it for Thanksgiving. Being out of town for Thanksgiving and the weekend and getting home late last night I didn’t have time and was too tired to stay up late to write up one of the other recipes I have photographed. I debated sharing the salad still and noting options for swapping the romaine but decided to hold off on sharing it for now. So I’m sharing a favorite from last year that was a go to healthy snack I kept on hand for the holidays that I had planned to make again this week. Swapping the protein powder for cacao as noted and maybe tweaking a little (omitting adaptogens this time) to fit my needs this year with baby on board. Hope you all had an amazing Thanksgiving and weekend along with a little relaxation before we jump into the busy hustle and bustle of Christmas. 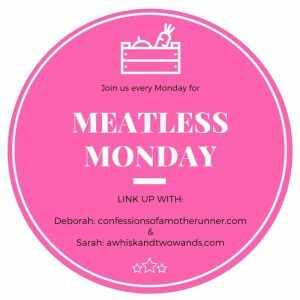 Hope you enjoy this recipe and link up with Deborah and I below, or check out some of the linked recipes, for Meatless Monday. Are you sitting down? You might want to because these delicious no bake Peppermint Brownie Protein Truffles are healthy and just might be what you need to keep you in that holly jolly mood! Did you know today is National Brownie Day? I was going to make a twist on one of my friends favorite brownie creations. Then then I thought about make one of my other no bake brownies but instead twisted them a little, a peppermint twist if you will, and rolled them into convenient bite size balls. I couldn’t wait I made them early, and then made them again, holding in from sharing them but what better day then National Brownie Day! My friends brownie dessert I decided to save it for her birthday in a couple months, hope she isn’t reading this. 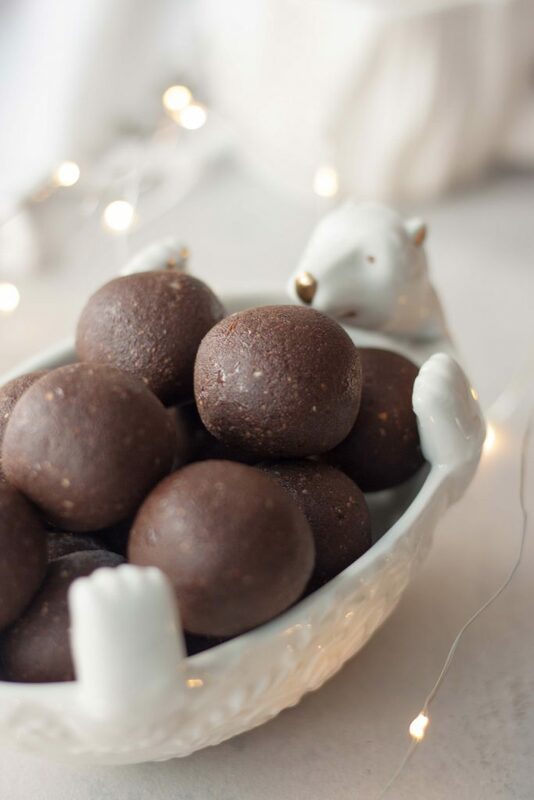 Can’t stop, keep popping these Peppermint Brownie Protein Truffles they’re keeping my spirits bright! Things are so crazy around the holidays and schedules jam packed and these keep me from getting hangry, especially in the afternoon but I have been caught having one with a cup of coffee in the morning too. 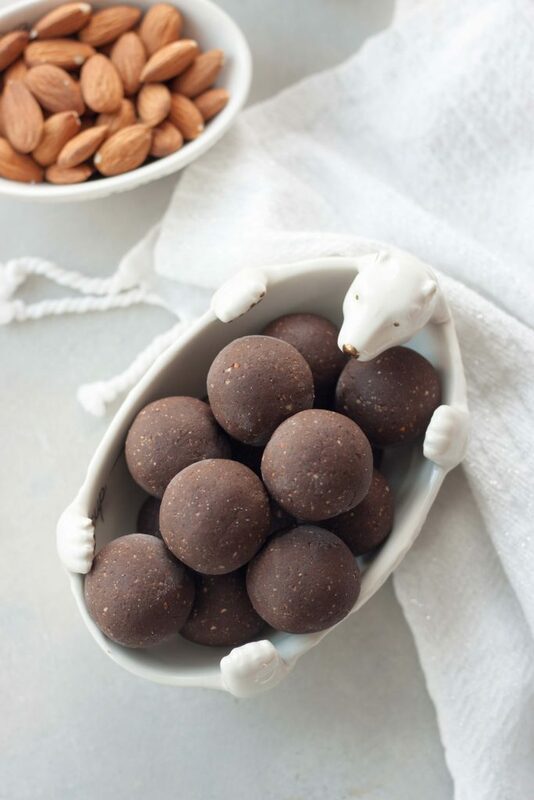 The best thing about these Peppermint Brownie Protein Truffles besides being quick and easy to make is that they’re healthy and keep the holiday sugar cravings in check. 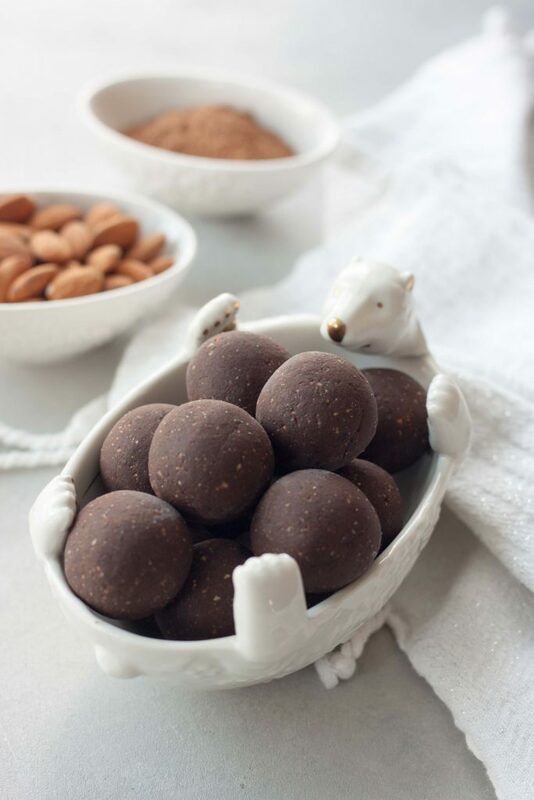 There are variations to these truffles but I like to make them with a combination of plant-based protein powder and cacao powder and then add maca (gelatinized maca powder) although I did make 2 batches with reishi and ashwagandha. I leave the adaptogens out of the ones for the girls. Craving a peppermint mocha? Maybe that’s why I made these as it wasn’t until I picked one up while running around that I really started craving the chocolate peppermint combo even tough it’s a family favorite. Coffee shop peppermint mochas are often too sweet for me and heavy so I usually go with half the syrups (mocha and peppermint) but it still packs a lot of sugar that can have me crashing later. With these Peppermint Brownie Protein Truffles I can get my fix with an Americano or coffee on the side. I just made a batch Tuesday adding in a little espresso powder for a Peppermint Mocha Brownie Bite version. Here is the breakdown and why I added the ingredients I did, most of the same ingredients I used when I made my Chocolate Maca Brownie Bites almost 4 years ago. Protein powder to bulk the truffles up and add more nutrients. There are two kinds of protein I use Vega and Navitas. I went with the Navitas Cacao and Greens in these, made with 5 kinds of plant protein, a powerhouse of greens (including spirulina), digestive enzymes and CFUs, and 14 superfoods and adaptogens! No fullers or sweeteners in it either. Cacao powder is one of the most powerful superfoods that’s packed with antioxidants, vinatmins, and minerals. Great for brain and cardiovascular health, they don’t call it good mood food for nothing. Coconut oil for some healthy fats to help keep you full (satisfied) and for energy and a metabolism boost. Raw almonds are a healthy fat that have protein, fiber, minerals, and vitamins. Health benefits include they help lower cholesterol, help keep blood sugar stable, and help reduce inflammation. They are also good for heart, brain, and metabolism health. Maca is a favorite, and if you’re a regular readier you already know this. Maca is great for energy, stamina, and strength. Not to mention balancing hormones which is why I started taking it years ago for fertility reasons. It’s also packed with vitamins and minerals but is probably my favorite adaptogen. I personally like to use gelatinized maca powder as it is easier to digest. 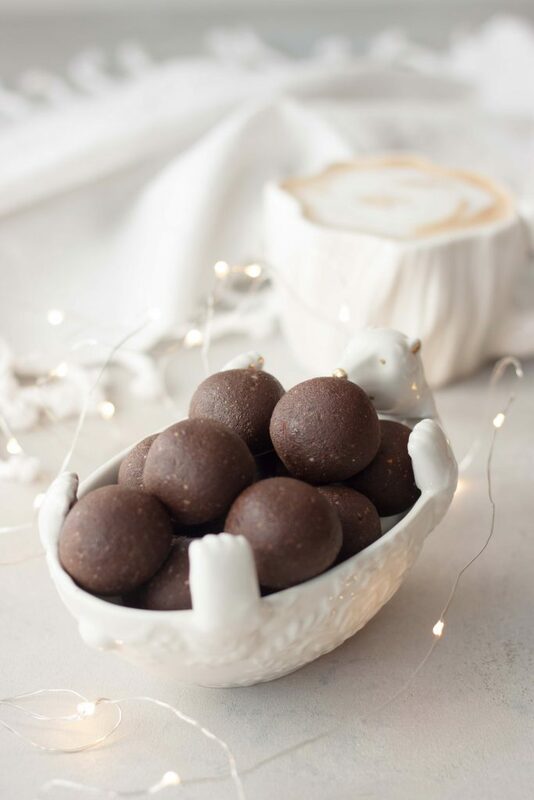 Maca is an optional ingredient in these Peppermint Brownie Protein Truffles and can be swapped for resihi or ashwagandha. Or omitted as I do for my girls completely. I am not a doctor or a nutritionist and always recommend doing your own research before trying new foods (superfoods, adaptogens). All ingredients are plant-based, vegan, and gluten free. You can use any protein powder, I just note my favorites and what I use. Adaptogens (maca, reishi ashwaghanda) are optional. Peppermint extract can be used in place of peppermint oil just adjust to taste and start with just a little as you don’t want to overpower the bites. Cocoa powder can be used in place of cacao powder, I like to use cacao powder in recipes like this for it’s health benefits. I am a Navitas Insider so I use Navitas Organics products, I do not make any money off the sale and you can use other brands this is just my favorite that I trust so I continue to support them and it’s why I am an Insider which does mean I receive a discount on products I purchase (only if purchased through them). 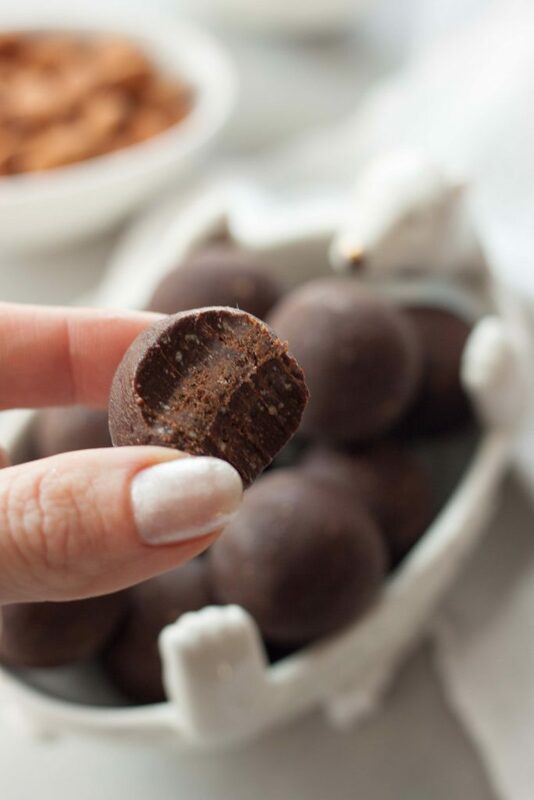 All the health benefits packed in these Peppermint Brownie Protein Truffles aside they are delicious and a guilt free treat to enjoy this holiday season! 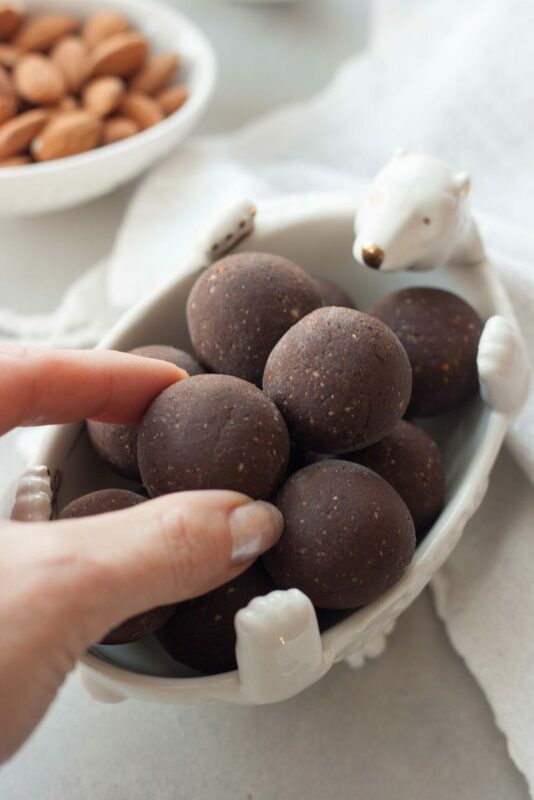 Decadent easy to make brownie truffles with a hint of mint that are healthy and packed with superfoods and protein! No bake, gluten free, dairy free, vegan, plant-based, paleo. In a food processor grind almonds to a medium to course flour texture. Add in cacao, protein, sea salt, and maca powder if using, pulse just to incorporate. Process almonds, add cacao, protein, sea salt, and maca. Pulse. Add in dates, coconut oil, and 2 drops of peppermint oil. Process until the mixture comes together in a crumbly dough. It should stick together when pinched between your fingers. Taste test and add a drop more peppermint oil, or more to taste if using peppermint extract. You don't want the peppermint to overpower the chocolate flavor so add a little at a time. Press and roll into balls, making 20-22 balls. Store in the refrigerator, or freezer. Best enjoyed at room temp or slightly chilled but not frozen. If taking on the go I like to pull them from the freezer if not eating right away. * You can substitute more cacao powder or a blend of cocoa powder for protein powder if desired. 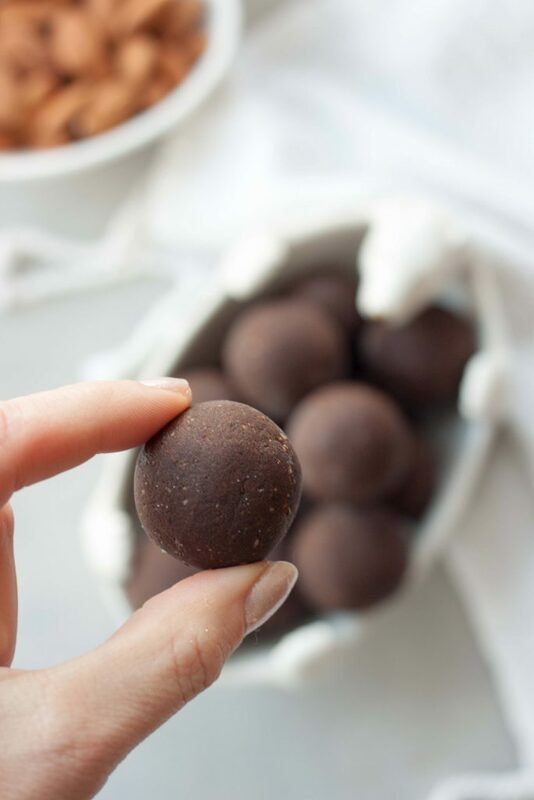 ** Peppermint extract can be substituted for peppermint oil, just add slowly a few drops at a time as some are stronger then others and you don't want the mint to overpower these truffles. Remember you can always add a little more. *** Maca is an option and can be omitted or you can add in another superfood or adaptogen like reshi or ashwaghanda. These look like they have the perfect texture! I need to try Maca! I use natural herbs to get my body back in gear after I quit nursing, and I’d love to add another superfood that will help that process! Thank you. The maca is optional but I love it for so many reasons I tried to only list a few or I could go on forever. So many superfooods could be slipped in, not all at once of course. It’s so hard not to get distracted by that adorable polar bear dish! I need that! But I also need a batch of these truffles – they are so happening. Haha, sorry he’s just so cute. It’s actually from a measuring set we got from Anthropologie. We have a few, so the girls can have them in their hope chests when they are older but we use the dishes for nuts, treats, ect during the holidays because they’re so cute. These truffles though are so good, hope you enjoy them as much as I do! Mmm, I need these truffles in my life! These are perfect for gift-giving too! Great idea, never thought about gift giving but planned on having them out and sharing them (with and without the protein) for a healthy treat option. What a delicious way to celebrate National Brownie Day! And I agree with Alisa, that polar bear dish is adorable! Thank you, of course I’m off a day… it’s tomorrow! Oops! The dish (part of a measuring set the smaller ones go inside) is a favorite! Have everything for this recipe in the pantry. It’s a winner for me! This recipe looks beyond DELISH! Cannot wait to whip some of these up! They are absolutely perfect to bring to a party or to gift to your neighbors…YUM! Thank you for the post! These look so good! I don’t think I have seen a more perfect ball! I did not know it was national brownie day but this is a great way to celebrate! I have been craving peppermint, how did you know? perfect timing . I love the combination of peppermint and chocolate…although I would enjoy this any time of year, it’s perfect for the holidays. Truffles! I am very excited that you made these and that they are vegan. I love truffles. I love your bear dish!! These look so delish… I love your clean ingrdients and your combo of peppermint and chocolate. SO YUMMY!!! These look awesome!! Love that they’re full of protein and you used coconut oil. I bet they’re just divine. Anything bite sized is a for sure temptation–and when there’s chocolate involved!! I agree that having the protein involved too is perfect.